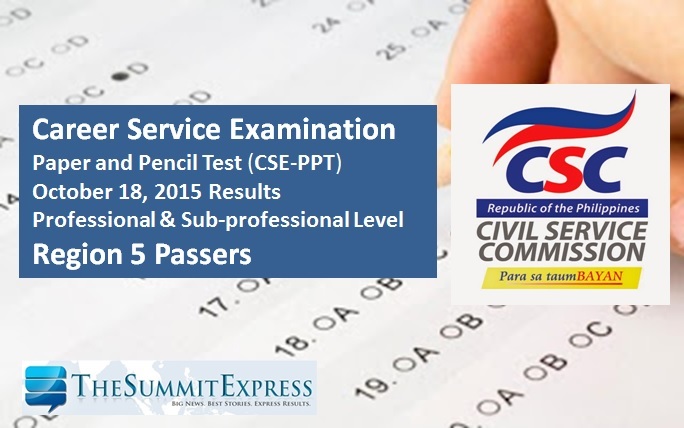 MANILA, Philippines - The Civil Service Commission(CSC) has announced on Saturday the results of October 18, 2015 Civil Service Exam- Paper and Pencil Test (CSE-PPT) also known as Career service examination. The alphabetical list of passers for Professional and Sub-professional level for Region 5 (Bicol Region) is available on this page. Region 5 is among the testing centers with considerable turnout of examinees. The CSC named a total of 122 new passers for the sub-professional level and 1,003 for professional level. CSC said that individual test result generation through OCSERGS (Online Civil ServiceExamination Result Generation System) for October 2015 CSE-PPT passers shall be available by Dec. 14, 2015 and thereafter.